Bird-watching is a popular hobby, but distinguishing between seemingly look-alike birds such as finches and sparrows can be tough. Look to their body shape and markings for the most obvious clues, while taking hints from their location and preferred foods to identify which of these avian creatures has flown into view. While these two birds may appear very similar to the untrained eye, an easy way to tell them apart is to observe their coloring and markings. Sparrows can be any number of shades of brown and gray, with males displaying brown streaking on their chests. Both male and female finches may have streaking. Depending on the species of finch, males may have brightly colored plumage in shades of red, yellow, orange or blue, while female finches have brown or gray feathers. Another way to identify your finch or sparrow is to check out its size and shape. Sparrows are medium-sized birds, about 12 to 18 centimeters long, with short legs, a short bill and rounded head. A sparrow's tail will be rounded, and his wings will broad in comparison to his body. Finches are smaller than the sparrow, with large beaks and flat heads. A finch's wings will appear short compared to his body, and his tail will contain a noticeable notch at the end. For most of the year, sparrows feed primarily on on fruits and seeds, but during their mating season in the summer, they will switch to catching insects. Finches choose to feed on plants, preferring seeds, flower buds and fruit, and can commonly be seen snacking at bird feeders provided by their human neighbors. Sparrows prefer to call open spaces home and are rarely seen in forests. 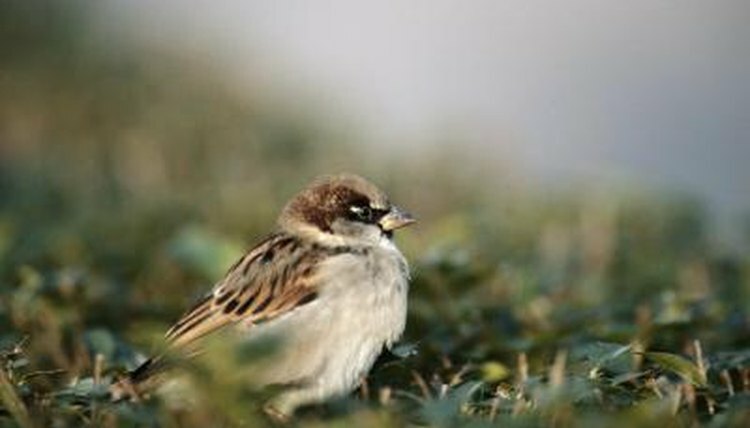 Though sparrows were originally native to Europe, North Africa and Asia they are now found all over the world thanks to human trading, and types of habitats can range from marshes to deserts to city suburbs. Finches are native only to North America and are commonly found in forests and areas populated by humans. Margot Freeman has been a writer since 2009. She currently works in social media within the tech industry, and has been volunteering with acclaimed Austin, Texas animal shelter Austin Pets Alive! since 2010. Freeman holds a Bachelor of science in audio and media technology. How Big Can a Hummingbird Grow? Are a Swallow & Sparrow the Same Thing?